Declining growth in Vietnam’s dairy market continues unabated and local enterprises will face greater competitive pressure when seeking new growth in 2019. A number of leading local players recorded slower profit growth last year and now seek opportunities to invest in expanding their high nutrient and healthier categories as well as exports, either via joint ventures or mergers and acquisitions (M&As). Local consumers have become increasingly choosy when purchasing dairy products and as Vietnam’s middle-class rises, better living standards see demand for high-quality dairy products and beverages head upwards, according to the Rong Viet Securities Company (VDSC). Growth in total dairy revenue in 2018 increased only slightly compared to 2017. In the first six months of last year, growth in total spending on dairy products was less than 5 per cent, though spending in both urban and rural areas showed signs of growth in the third quarter. The overall decline was primarily due to falling sales in two categories - liquid and powdered milk - which normally contribute nearly three-quarters to growth in total value, according to the Vietnam Dairy Association (VDA). 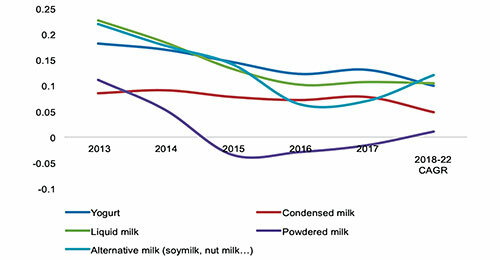 Liquid milk production reached 1.5 million liters in 2018 while powdered milk reached 138,000 tons, both up 2.1 per cent compared to 2017. In particular, some 70 per cent of liquid milk production was reconstituted milk, with much lower nutritional value than fresh milk and partly leading to the shrinking growth. Demand for fresh milk such as UHT (Ultra high temperature) milk and pasteurized milk are increasing, however. Vietnamese consumers are now responding to the latest trends around the world, where a preference is seen for high-quality, organic milk, A2 milk, 100 per-cent natural fresh milk products, and products from walnuts and macadamia nuts, according to Vinamilk, the leading local dairy company. In terms of powdered milk, NutiFood, Friesland Campina, and TH true Milk have all made efforts to acquire more market share from Vinamilk, through launching new products over the last two years. Thanks to such a strategy, NutiFood now has over 15 per cent of total market share in powered milk, up from 10 per cent in 2014, and follows only Vinamilk, which has 40.6 per cent. Other international dairy brands like Abbott, Mead Johnson, and Nestle, which have strengths in terms of marketing and research and development (R&D), are more competitive against Vinamilk. In order to expand production to meet domestic consumption and export demand, NutiFood has invested some $88 million in a new factory at the Song Than 3 Industrial Park in southern Binh Duong province, and will expand its existing Hung Yen province factory in Vietnam’s north. In addition to its three existing factories in Binh Duong, Hung Yen, and the central highlands’ Gia Lai province, another is under construction in northern Ha Nam province. Similarly, the Moc Chau Milk Company plans to introduce products such as cheese, butter, and premium organic milk. GTN Food, which owns Moc Chau Milk, plans to boost the local producer’s growth through expanding distribution networks and cattle heads. It holds about 30 per cent of the liquid milk market share in northern rural areas and 2.7 per cent of total market share. Preparations are underway to expand into the southern market through developing 23,000 35,000 cows over the next two years. As such, production capacity will reach 125,000 tons per year, up 160 per cent compared to current capacity. Earlier this year, it also launched a series of new products, such as fresh pasteurized milk with banana and sour milk cheese. The company expects revenue to increase about 5 per cent, equal to growth in the market as a whole. Vinamilk has also had a number of investment projects in the US, New Zealand, and Cambodia in recent years, in addition to its 13 factories in Vietnam. These projects have helped increase its capacity to better compete in domestic and international dairy markets. Overseas factories are also helping it compete well in more than 43 export markets and the domestic market, where it also competes with foreign dairy brands. Vinamilk plans to launch a premium organic powdered milk product for children this year, which will compete directly with foreign brands in terms of price. In recent years, its market share in infant formula has increased mainly thanks to its Optimum brands (in cities) and Grow Plus. “We constantly observe the latest trends around the world, promoting product R&D and partnering with leading international companies to meet nutritional needs and improve the physical condition of Vietnamese people,” said Mr. Phan Minh Tien, Vinamilk’s Managing Director. Local dairy companies may face obstacles handling demand for plant-based dairy products, as these differ greatly from their regular portfolios. It will take time for them to change product structures and meet market demand, according to Ms. Dang Thi Phuong Thao, an analyst at VDSC. They currently must import high-quality cattle from Europe and North America, leading to higher expenditure. At the same time, Vietnam’s hot and humid climate is simply not favorable for dairy farming and affects output quality, she added. “Companies that fail to meet this trend will be subject to declining growth and market share,” she believes. VDSC appreciates the efforts of two dairy companies, Vinamilk and TH true milk, which have caught up with this trend through the launch of high-end dairy products. They are also building a closed production model from farm to finished product, increasing self-control over farming areas to better control production costs and increase output quality, Ms. Thao said. VDSC has forecast that long-term growth trends in the dairy industry will remain positive. Dairy consumption per capita in Vietnam is still at a low 26 liters per person per year, compared to 35 liters in Thailand and 45 liters in Singapore. At the same time, other factors such as Vietnam’s large, young, quickly-growing population and increasing incomes of the middle class will promote demand for milk in the long term. 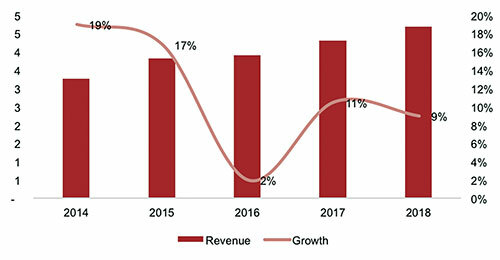 Market researchers Statista have forecast revenue of $2.4 billion in 2019, with average revenue per capita of $24.63, and annual growth of 7.3 per cent in 2019-2023. Under the Comprehensive and Progressive Agreement for Trans-Pacific Partnership (CPTPP), dairy products from Japan, Singapore, and New Zealand are no longer subject to import tariffs, which will translate into lower prices of foreign brands from these countries and increased competition for domestic brands, according to Mr. Tran Quang Trung, Chairman of VDA. VDSC believes that the advantage will belong to companies that have prepared sufficient resources to catch up.